How to Instantly Increase Your Fan Base with Electronic Editions of Your Book! Every published author knows the satisfaction of seeing their hard work transformed into a beautiful new book to hold and share with friends and family. Authors who self-publish through Outskirts Press especially know the joy of holding their professionally designed books in hand. But there’s a huge group of loyal “e-readers” looking for electronic editions-potential fans who won’t have access to your book if it’s only in print form! Along with the paperback or hardcover edition that is included with the various Outskirts Press publishing packages, authors have the option of releasing an e-book edition of their books-whether it’s for Kindle, Nook, Google and/or iPad. If your goal is to reach as many readers as possible, consider taking advantage of this easy, affordable option and release your book in multiple formats! Printed books will always be coveted by diehard booklovers. We love libraries and bookstores and eye-catching covers, and we love filling our shelves at home with our favorite titles. Most books still do best in physical form, but there is a growing number of bibliophiles who love their electronic reading devices…and tend to shop for digital editions of books as well as hard copies. Is YOUR book reaching this important demographic? Digital editions also make an easy an inexpensive way to provide reviewers with a free copy of your book or to hold a contest where the winner receives your digital edition. Independent authors should take advantage of this digital technology and deliver their books into the hands of an enormous group of consumers. And Outskirts Press authors have the advantage of a team of publishing professionals to make it happen. After all, more formats of your book mean more exposure, and more exposure translates to more success for you! 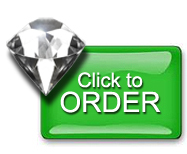 Outskirts Press makes it easy for self-publishing authors to maximize online distribution of their books. 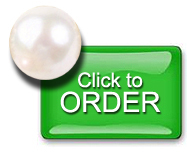 We offer several formats for digital editions, including Kindle, Nook, Google and iPad. Are you ready to publish your own book? Get started today! RECEIVE $599 OF ITUNES DISTRIBUTION FOR FREE! Want to get your book on iTunes and in front of millions of readers? In May, you can do just that! We are including an iPad/iPhone e-book edition with iTunes distribution to any author that purchases the industry-leading Diamond publishing service or our full-color Pearl publishing service. That’s valuable exposure for your book and a great deal for you! Quick and easy way to get your book listed on iTunes! Standard retail price of $9.99. No fretting over how to price your book on the iBookstore. Guaranteed royalty amount. With standard iBookstore pricing, you’re guaranteed a royalty of $4.00 for each and every book you sell. With the added exposure of the Apple format, that could add up to a lot! No imprint required. No need to publish under your own imprint or mess with ISBNs. This option lets you publish without those requirements. Quick, seamless publishing. The iPad/iPhone Edition goes through Outskirts Press, so you can forget all the hassles of exchanging bank account numbers and other private information. We do everything for you behind the scenes. How simple can it be? 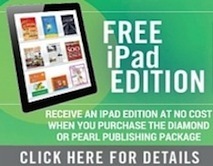 To receive this offer, simply add the popular Diamond package or the full-color Pearl package and enter the promotion code iPadMay16 during check out. It’s that easy! Give your book the exposure it deserves-get started today! Celebrate Earth Day with these Great Books! Celebrate Earth Day with Ecofriendly Book Publishing: Everyone Wins! Is Your Inner-Poet Ready to Shine? Our Poetry Formatting Kit Is Just For You! James A. Cutchin grew up in a rural neighborhood in the Florida panhandle. He received his B.S. in social science from Florida State University and completed a hitch in the Army which included a tour of duty in Viet Nam. Upon his discharge from the Army James moved to Hawaii where he spent the next several years as a successful entrepreneur in the resort industry. 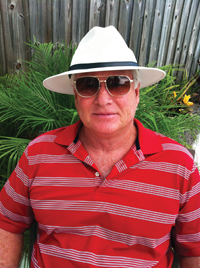 After thirty-five years he has returned to the panhandle of Florida to retire and continue writing. James has traveled to more than 100 countries and combines his passion for writing, travel and love of history to bring stories to print that beg to be shared by a modern-day audience. When Private Wotjek joined the Allied fight during World War II, his comrades could not imagine the impact his presence would have in the war. However, soon after his arrival, they realized what a valuable asset Wotjek would prove to be. There was only one small problem: Wotjek was a bear. “Once A Hero” is a historical novel of a Syrian brown bear cub that was orphaned and later, through serendipity, landed in the hands of Polish soldiers escaping the Soviet gulags. The tale is not only endearing, but also based on true events. 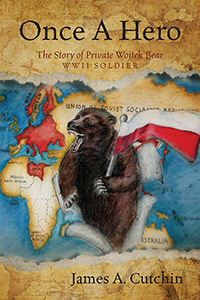 The bear in the story is today honored and celebrated in several countries for his heroic actions during World War II. The story profiles the bear from birth to adulthood. The journey of a band of Polish soldiers is interwoven in the plot as they travel from their homes in war torn Europe, escape from the Siberian gulags, and travel through the Middle East into Africa. Eventually the paths of the bear and the soldiers cross, and the ten-pound cub is adopted as the troops’ mascot. “Once A Hero” is rich in historically and culturally accurate detail. The characters are well-developed and endearing. Vignettes of colorful escapades are written in a delightfully humorous tone keeping the reader entertained though out.